The latest purchase for our UK and Europe trip is an awning for our newly purchased Motorhome. We purchased a Fiamma F45 S 300 (3.08 metres) awning. Some that are for sale are simply sun shades but we wanted something more substantial than that. This one will keep rain out too. We also purchased a TOMTOM Start 25 M EU GPS Sat Nav - with UK, Ireland and Full Europe Maps. 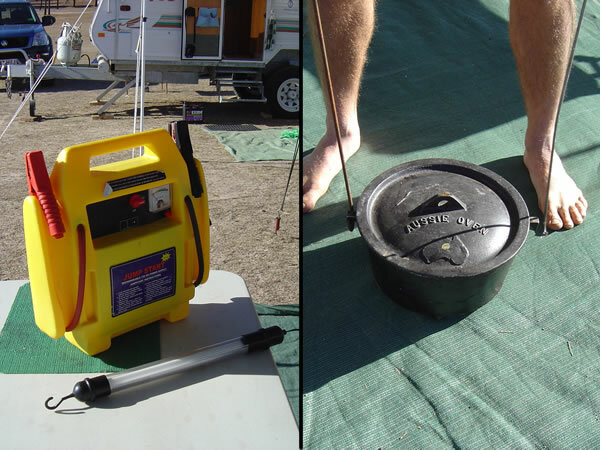 The latest purchase in Australia, is an electric motor for the canoe. 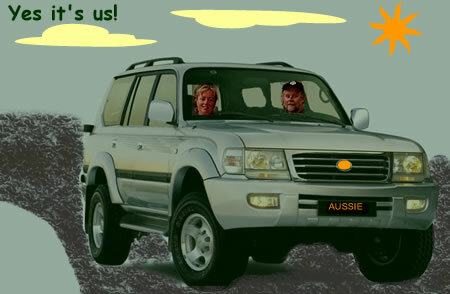 Yes, I know we need the exercise and we DO still intend to paddle most places but for trips like the one we made across Lake Catharaba and up the Noosa Everglades a motor will be very helpful. We bought a small Sevylor Electric Motor. We have purchased a fibreglass and plywood bracket kit sold by Kayanu to attach it with. See the photos of the bracket and the motor. We used it on our trip to Boondooma Dam. It doesn't go very fast so we used it mostly as assisted paddling for those long stretches but when you want a rest it is nice to sit back and let the motor do the work for you. If you want something with a bit more speed (and you have a lot more $$$) then you can't go past the Minn Kota electric motor. For our purposes the Sevylor seems sufficient. To allow for extra shade from the heat and protection from rain we have had two canvas awnings made up for the van. We already had the full annexe that goes on one side and the awning for that is mounted in a bag along the van's roofline. We put on metal sliders on the other 3 sides of the van so that we can choose where we place the two awnings, if at all. We purchased two push bikes to take on the big trip. Of course - like the canoes - we will have to try them out before hand and build up the fitness level. No doubt they will feature in future web photo albums. We will now have to work out how we can mount the bike carrier on the van for when we travel. And then that may mean moving the spare tyre to a different place...?? What equipment do we already have? dome tent, tarps plus poles pegs etc, folding table, folding chairs, 3 burner cooker, Chescold 3 way fridge (gas, electric, battery), eskies, hammock (a definite necessity), air beds, sleeping bags, gas light with extender pole, food boxes (sealable), camp oven, campfire cooking equipment (BBQ plate, billy, tripod, toaster rack), Flouro Light (240/12 volt) etc etc etc. 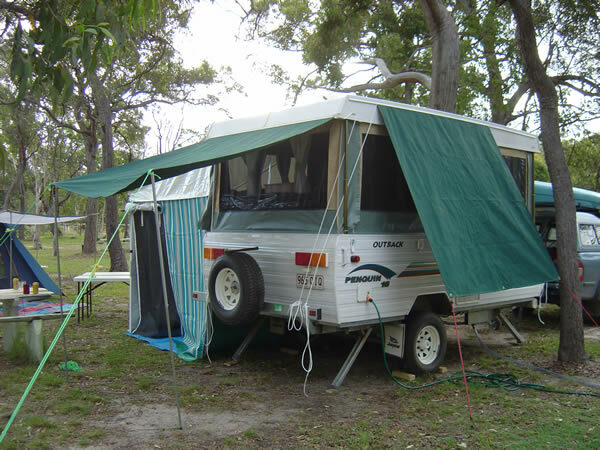 We will still need all that for some of our holidays eg Fraser Island, but now we have the offroad camper trailer it opens up a whole range of new possibilities. 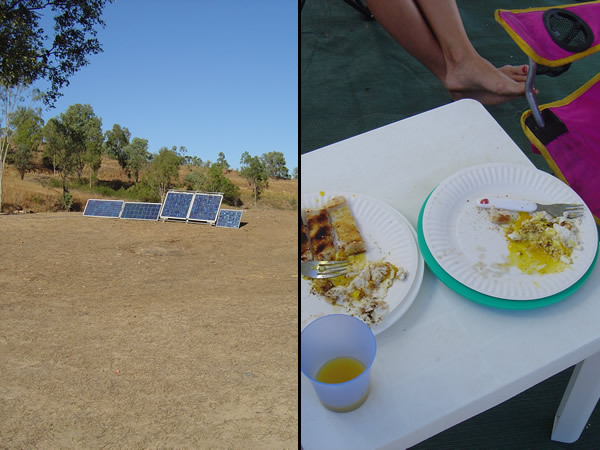 We bought a small inverters (convert 12V to 240V) for our trip and have used it most holidays since then. It is great for charging batteries either in the car through the cigarette lighter or directly off our spare caravan battery. We also had no problems charging our laptop computer using the inverter during the Big Road Trip. Do we need a canoe? Is there water involved? Yes. Then sure we do! I can think of lots of places where a canoe would come in handy - Katherine Gorge in Northern Territory and Yardie Creek in Western Australia for starters. Of course we would need a bit of practise first so Karen & Gary (our road trip buddies) as well as Pete & I, both bought a Canadian Canoe each - our first real purchase for the road trip. We bought it while the Xmas specials were on for only $950. It seats 3 adults so is quite large but yet light enough to be carried on our Holden Astra roof racks. 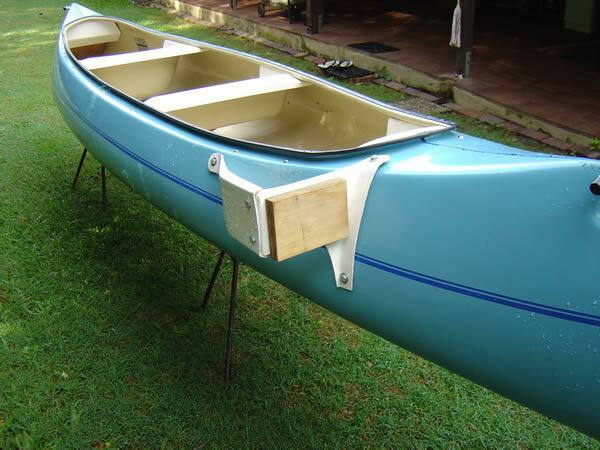 For more information & details about our 'Wallaroo' Canoe you can go to the Kayanu Website. Look at our Lake Catharaba Album for photos of our first weekend canoe trip in Feb 2004. Make sure you check out the Trips and Photos web page for photos and info on our other canoe adventures around South East Queensland. Gary has fashioned a contraption for towing the canoe by hand. He hasn't mastered cornering yet but on a straight run it certainly beats carrying the canoe to the water. I must remember to get a photo of it for this page. What other equipment do we need to get? 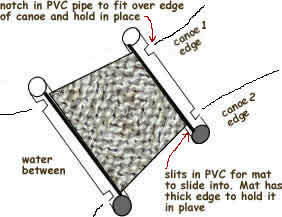 We are considering an electric motor for the canoe - paddling is great but in some places a motor could be very useful - especially when one of us is fishing from the canoe. Having only one person paddling is a lot of hard work - especially if you want to avoid going around in circles! I also remember the fresh water crocodiles on the banks of the creeks and gorges in Northern Territory when we did our last trip around Australia. They say the 'freshies' won't hurt you - it is the salt water crocodiles you have to worry about. All very well to say that but I can imagine that electric motor would be much appreciated in those conditions as well. 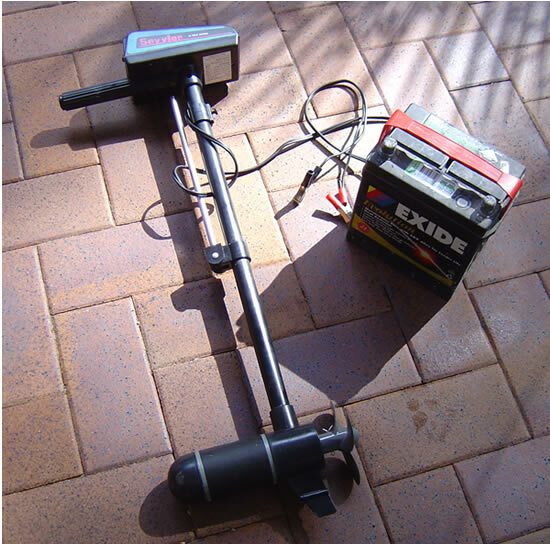 We have looked at a Minn Kota 12 Volt Saltwater motor which we are considering. We are also investigating a platform to link the two canoes. It has to be something easily put on and off and can't take up much space in the canoe when we remove it (possibly made from two pieces of PVC piping and 'trampoline mat type' meshing in between) . Another purchase ...we have a digital camera but need a tripod for it. I have got to be able to take some good photos for this site haven't I? 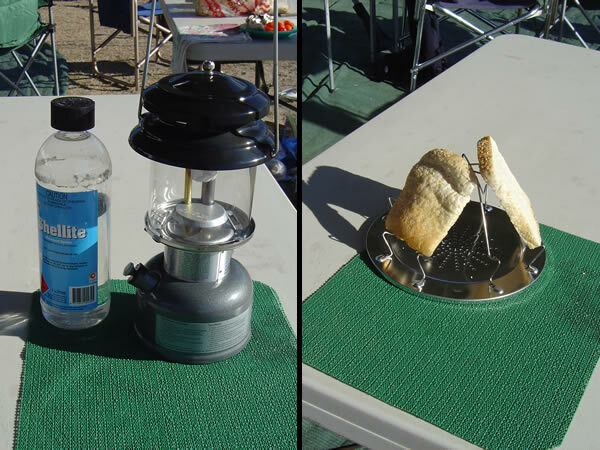 To outfit the new Camper Trailer (van) we needed cutlery & break-resistent crockery & cooking pans & utensils. 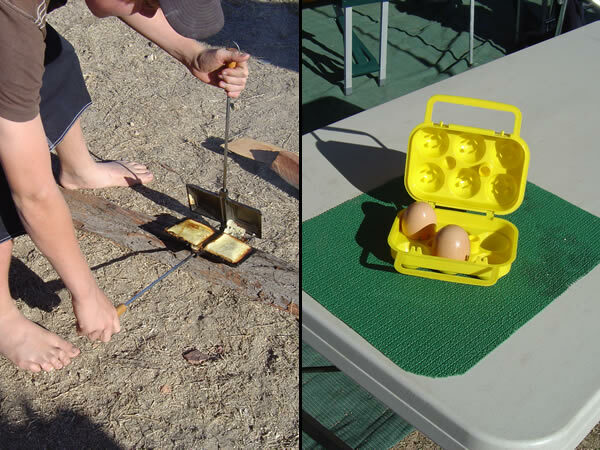 Some of the double-ups in the kitchen and camping cupboard were able to be donated to the van. We purchased anti-slip material in a roll from Spotlight and cut to size for drawers and cupboards. This saves sliding around in cupboards when travelling on 4WD tracks especially. We purchased some 'eggshell' foam overlay for the mattress because van beds are notorious for their high density foam being a little uncomfortable. We bought two hand held UHF radios. At two for $79 you couldn't go wrong.. We are still deciding whether we should purchase an in-car UHF but in the meantime these two are quite handy when two cars are travelling together. In the best conditions they work up to 5km apart but usually you can rely on 3km. These are the cheapest and hence the smallest range. The more you pay the better range you can get. We also found it good when walking around small towns if one couple headed off in a different direction. Cheaper than using the mobile phone to find each other! Not sure what else yet... stay tuned to this site.